Originally published in 1984, Andersen Press have reissued this stunning masterpiece as a brand new hardback with all the original illustrations. I’m going to be honest here…I’d never heard of this book until a few days ago when I saw it propped up on display at work and of course, it immediately caught my eye. I love picture books for older children; you can guarantee a beautiful tale, often haunting in its illustrations and ‘The Mysteries of Harris Burdick does not disappoint. I think you can forgive me for sidelining this book for so long because we have been treated to so many other fabulous titles by Chris Van Allsburg…Jumanji and The Polar Express being the first two that spring to mind. 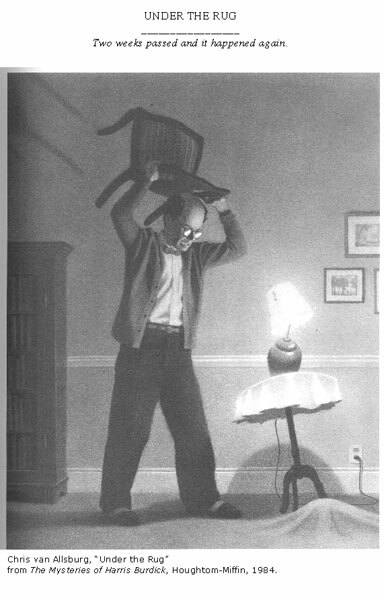 ‘The Mysteries of Harris Burdick’ is quite unique in its storytelling. The book features sixteen illustrations and an elusive sentence pertaining to how the author got the illustrations. That one sentence and one illustration, together create endless possibilities for the imagination. And even if you don’t consider yourself as very imaginative or creative…you will after exploring this book. Because that’s what it is; not so much a reading experience but an exploration of the possibilities of literature. You just have to look at the cover to know it’s going to be an adventure. You don’t know where the book will take you but you know it’s going to be good. And yes, in this case DO judge a book by its cover! When I first received this book to review for my magazine job, I set about reading it like I would any other; without having read any previous reviews or really knowing anything about it. When I finished reading, only a few days later I was deeply moved and that feeling stayed with me for a long time after. Since then, I’ve recommended the book to my fellow booksellers and to every customer I can stop. 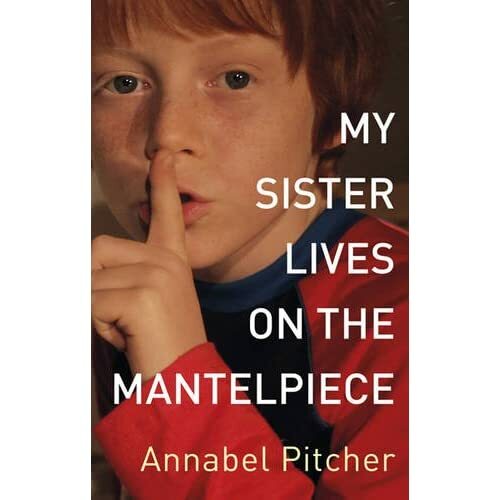 Written by debut author Annabel Pitcher, ‘My Sister Lives on the Mantelpiece’ is nothing short of a triumph. It is rare to come across a book by a new author that is so well established and confident in the story that is being told. But it’s a story of human loss and love…of raw emotion – something we all deal with but can rarely share with one another. We follow the story of Jamie who has been through a lot of tragedy in his life – far too much that a boy should ever have to go through. Hiis sister lives on the mantelpiece…in an urn. Ever since Rose was killed in a London terrorist attack things have been terribly hard for James; his Mum has left and Dad drinks. The only hope he has left is from sister Jas and intriguing new school friend, Sunya. This really is a heartbreaking story, not only for James and the devastation left in the wake of her death but also for the reader. But it’s also a read full of hope and moving on and is sure to resonate for a long time. Liz Kessler, author of the Philippa Fisher and Emily Windsnap series’ is back with a book of heartache, humour and knowing what to do when life doesn’t always go your way. 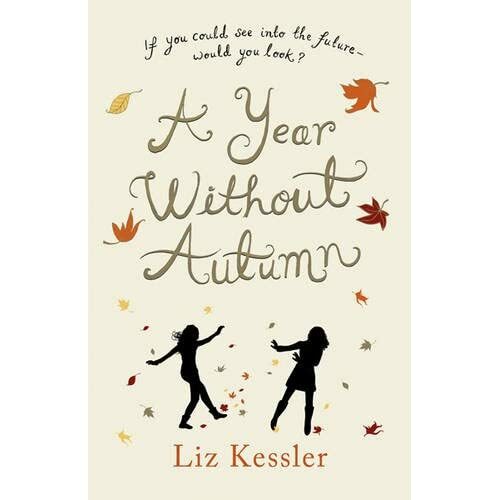 A Year Without Autumn is a magical read in notion, but in reality is disarming and deals with real, compelling issues. When Jenni Green is taken in to the future, she can’t comprehend the life in front of her. Her best friend Autumn’s life is in turmoil; her Mum is close to a breakdown and her brother Mikey is in a coma. But given a rare opportunity, Jenni has the power to change everything and help her friend. But it’s not always easy getting back to present day…especially if you have no idea how you ended up in the future in the first place! This is a charming book which really made me stop and think about fate. Written with wit and passion, this is sure to be popular this spring. I really can’t recommend this book enough. It’s a welcome break from the frustrating trends we have seen in teen fiction recently and although there is the supernatural time travel element to contend with, we are rewarded with wonderful characters that I couldn’t help but become attached to. And have you seen the cover? Pure joy. Louise Rennison has become something of a household name for teens of the noughties and beyond. 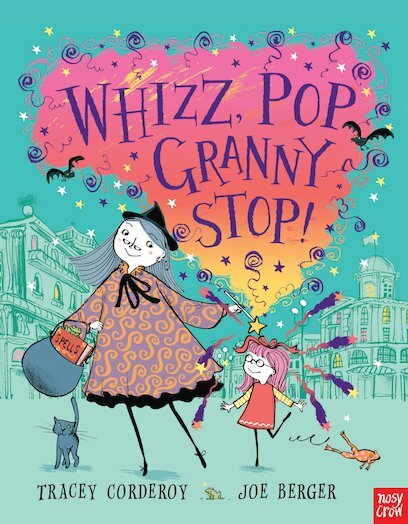 She is the obvious choice to follow on from Jacqueline Wilson’s books and is a refreshing read away from vampire and fantasy fiction. 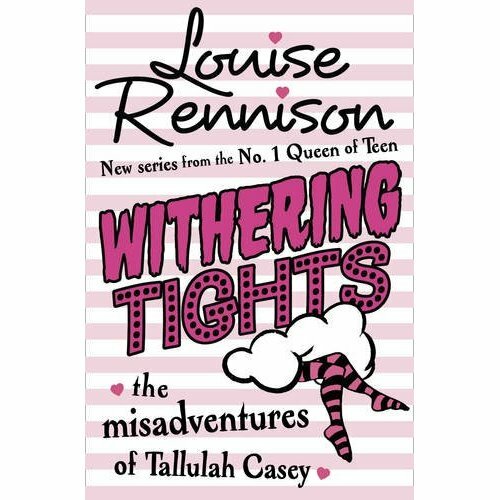 ‘Withering Tights’, which was published in paperback in February follows on from the huge success of the Georgia Nicolson series (think Angus, Thongs and Full-frontal Snogging) with a brand new heroine; Tallulah Casey! This brand new series follows Tallulah and her friends who join the Dother Hall Performing Art College summer school for a fun filled summer of performing, with the added bonus of lots of boys and absolutely no parents! It’s clear to see why Louise Rennison won the Roald Dahl Funny Prize for her book. She’s in tune with her impressionable reading audience and calamities involved with pursuing your dreams, and boys! Set in the northern Dales of England, this is hardly the Hollywood Hills but that’s what makes this tale all the more funnier and all the more real. I’m certain Tallulah will be as big a success as Georgia…if her tights are anything to go by, she’s sure to make an impression on readers. ‘Polly Plays her Part’ is the second book in the Star Makers Club series written by Anne-Marie Conway. ‘Phoebe finds her Voice’ is Anne-Marie’s first novel and was shortlisted for the Times/Chicken House Children’s Fiction competition. Aimed at the 8-12 audience, this book and the others in the series appeals to boys and girls…especially those who like to be in the spotlight. Get the hairbrushes ready and mirrors polished; the spotlight is on you! Each book in this series is self-contained but is based around the Star Makers Club. In this second book, Polly is having a few family troubles to say the least. She’s got a Mum who is more focused on sombrero’s than Polly’s spotlight, a Stepmum who is being a bit TOO nice and a leading part in the brand new Star Makers’ Production. I think the cover is quite deceiving. Obviously produced to appeal to those who like Daisy Meadows and Cathy Cassidy; Anne-Marie’s books actually deal with some quite important issues around growing up. In this book, Polly must juggle her mum and Dad splitting up, a stepmum joining her family and she learns about internet safety the hard way. In these times when children are using gadgets and have the freedom to use the internet at such a young age, this book is testament to just how careful we should be. Of course, this book certainly isn’t serious throughout and relies on the dazzle of The Star Makers Club to lighten the mood. The result is an hilarious, often touching read about Polly, a young girl just trying to find her footing on the stage and at home.